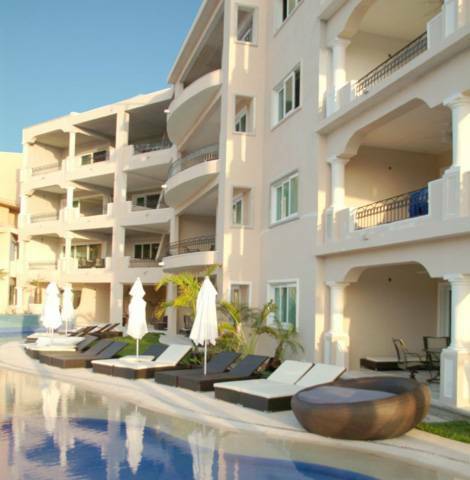 Aventuras Club is a private residence club located in Puerto Aventuras. We have two buildings, one on the marina and the second one in a private inlet of the lagoon. Our customized one, two and three bedroom villas are lavishly furnished, decorated and supplied with every item necessary so you can simply arrive with your personal items and begin your vacation. * Free Flowing Pool with Waterfall. * Outdoor 10-Person Whirlpool Tub. * Palapas on the Beach. * Free Transportation in Puerto Aventuras. * Interior and exterior maintenance. 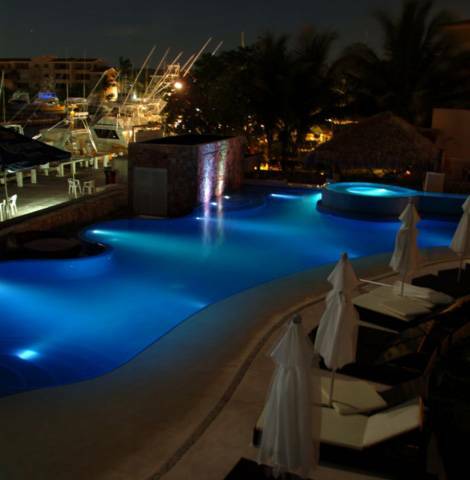 Puerto Aventuras offers more activities than any other resort community in the Mayan Riviera. Water activities include: swimming with trained dolphins, snorkeling in the calm clear seawater of our caleta or our freshwater cenote, snorkeling and scuba diving the beautiful reefs within view of our white sandy beaches, kayaking the calm waters of our lagoon, deep sea fishing from one of the many charter boats moored within the marina, taking a ferry boat ride to Cozumel or just relaxing by the pool. Activities available for those desiring to keep their feet on dry land include: walking, jogging or riding bicycles on the quiet streets of our community or exercising at the fitness center. For those that are competitive, you may challenge your partner or friends in a game of tennis, beach volleyball or golf at one of our facilities within walking distance of your villa. We have two buildings, one on the marina and the second one in a private inlet of the lagoon. Our customized one, two and three bedroom villas are lavishly furnished, decorated and supplied with every item necessary so you can simply arrive with your personal items and begin your vacation. 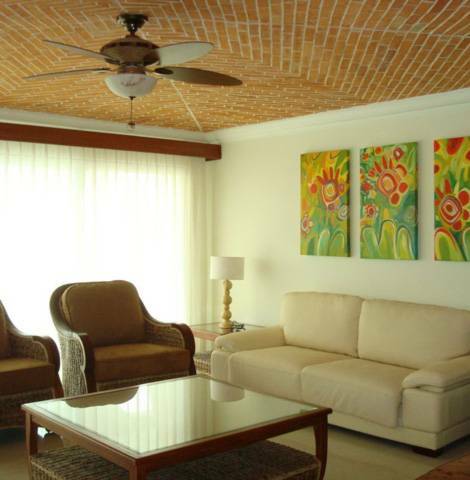 - Fully Furnished in Caribbean décor. - Cove Lighting in Dining Rooms. - Brick Pavers on ceilings in Living Room & Master Bedroom. - Walk-in Showers with Seats. - Double Vanities in Master Baths with hand painted sinks. - Granite and marble counter tops. - Stainless steel appliances. - Arched Solid Mahogany Doors. - Solid Mahogany cabinetry. - TV's, DVD Player and Stereo. - Electronic Keyless entry locks. - Insulated Concrete Walls. - Art display niches. - High speed internet. - Desk in Master Bedroom. - Dining capacity for 10 people. - Family room seating for 8 people. - Televisions in all bedrooms. - Covered terraces. The beautiful resort community offers diving, snorkeling, deep sea fishing, biking, golf, swimming with the dolphins, shopping, fine dining and much more. 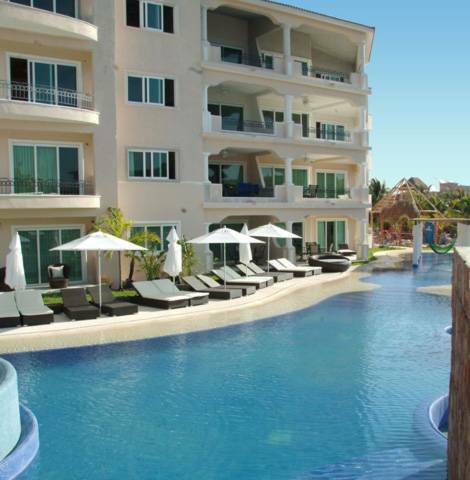 Aventuras Club provides its owners some of the best fractional real estate to be found in Mexico. Your vacation in mexico awaits! 25% payment in advance, rest must be payed upon arival. Cancelations must be 14 days in advance in order to get the refund. All refunds are given on next stay on the hotel. From hotel all taxis and shuttles towards tulum can leave you in Puerto Aventuras. 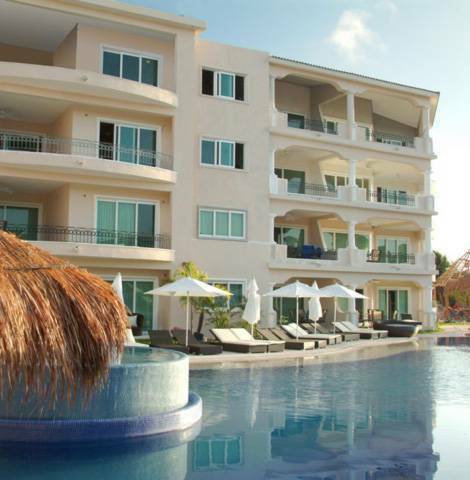 Once inside you should ask them to take you to Aventuras Club, next to the Portobello Condos. Free transportation inside puerto Aventuras.